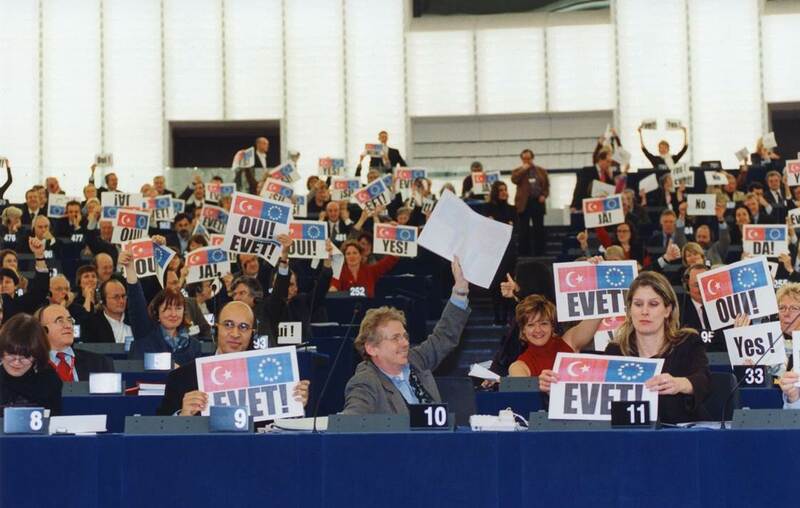 The Helsinki European Council of December 1999 granted the status of candidate country to Turkey. European Council of December 2004 confirmed that Turkey fulfils the Copenhagen political criteria which are a prerequisite for opening of the accession negotiations with Turkey. As agreed at the European Council in December 2004, accession negotiations have been launched on October 3, 2005 with the adoption of the Negotiation Framework by the Council of the European Union. "Negotiation Framework Document" takes account of the experience of fifth enlargement process and of the evolving acquis. The framework includes the principles governing the negotiations, the substance of negotiations, negotiating procedures and list of negotiation chapter headings. This document consists of three fundamental elements on which the negotiations will carry out. 3- Establishing and strengthening the dialogue with civil society and in this regard undertake a communication strategy aimed at both the European and the Turkish public. These three elements are being coordinated by the Ministry for EU Affairs by establishing distinct and specific mechanisms. The launch of accession negotiations would not be possible unless Turkey had not met Copenhagen criteria to a certain degree. From then on, Turkey's progress is being closely watched by the EU. Although economic criteria is not a subject in any of the negotiation chapters, the improvements in this area will present a point of importance due to its potential of being used as a criterion for the further opening of chapters. Therefore, it is Turkey's duty to provide a sustainable economic policy, reduce monetary imbalances and fight inflation with fiscal discipline. Accession negotiations describe the time frame given for Turkey to fully and effectively adopt the EU acquis to her own legal system. The EU acquis refers to the total body of the EU law. It is composed of roughly one hundred and twenty thousand pages. It contains the treaties on which EU was formed, the changes to these treaties, the treaties that the previously accessed countries signed and the legislation enacted by the EU Commission, EU Council, European Community and EU Court of Justice. The accession negotiations have begun with the first stage of the process, "screening". The main contributors to this process are Turkish bureaucrats and the EU Commission members. The main purpose of screening is to speed up the accession process. It is the process in which information on the legislation under the acquis is provided, the differences between EU legislation and legislation of the candidate country is determined, and a broad calendar of the accession process and the potential obstacles that may get in the way of this process are determined. Shortly after the EU Accession Negotiations was launched on 3 October 2005, Screening Process was started with a meeting on the Chapter "Science and Research" on 20 October 2005. Screening Process for all negotiation Chapters was completed on 13 October 2006. Upon the completion of the screening process for a given chapter, the EU Commission provides the member States a screening report. The assessments and propositions in this document play the vital role of determining whether the chapter is ready to be opened. In these reports the EU commission reviews the information given by Turkey during the screening process and according to this information decides whether Turkey is ready for the opening of the specific chapter. At the end of this document the EU Commission either suggests the opening of the chapter according to the given information or it presents opening benchmarks to be fulfilled in order for this chapter to be opened.